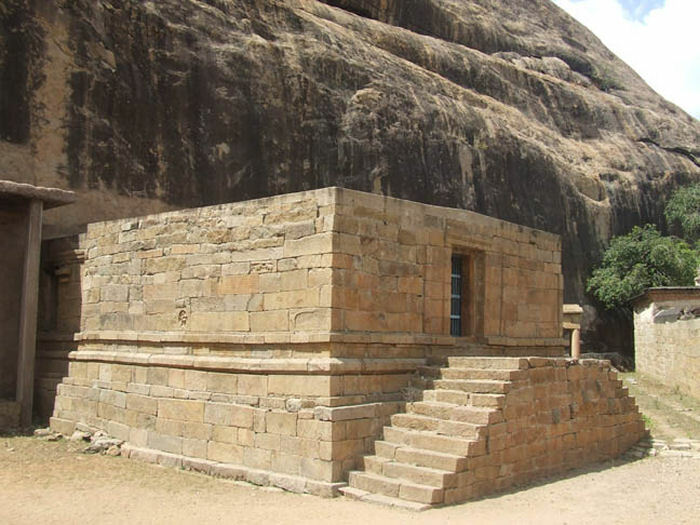 The structural mandapas in front of the rock cut cave are in a raised level and to reach it two way steps are arranged in its front with a flat resting in the middle. Stone blocks are arranged to form the walls of both the mandapas which possess only the adhishthana feature, lacking other wall segmentation and finished with cement roofing. The wall enclosure ends adjoining the mother rock on both sides. An inscription on the basement of the mandapa outer wall near the steps reveals that it was endowed by Raghunatharaya Thondaiman.10 Chola period fragment inscriptions and a beautiful dancing Siva miniature are seen on the southern wall of the outer mandapa. Both are pillared hall with four pillars each, comparing the inner mandapa the outer one is big. The pillars are segmented as three squares with kattu in the middle. The roof is covered with stone slabs. A Nandi is placed in the center of the outer mandapa facing the sanctum which belongs to the period of the mandapa. A narrow passage in the centre leads us to the inner mandapa where the bas-relief sculptures of Somaskanda and Chandeswara are seen. The inner mandapa adjoins the facade of the rock cut shrine. The facade has two pillars in the middle, pilasters on both ends and mother rock extension in the front as side walls, floor and kapota. The mandapa floor is evenly paved with the extended floor of the facade. The facade is 0.71mts and 6.74mts in east-west and north-south directions respectively and the pillars are arranged on the raised floor which is 0.05mts high from the facade front floor and mandapa floor level. The roughly formed kapota extends to a length of 0.95mts in the front and its canopy is flat. The extension of the rock cut floor in front of the facade is 0.86mts. The side walls of the facade are visible only on the top as it is concealed by the front mandapa walls. The height of the facade is 2.25mts. The rectangular mukha mandapa measures 6.74mts in north-south and 1.75mts in east-west directions. The lateral walls of the mandapa are decked with dvarapalas inside a niche. Both the niches are arched in the top and are more close to the facade than the rear wall of the mandapa. Vajana is seen running throughout the mandapa on the roof and also extended downwards along the rear wall. In addition with the vajana both on the eastern wall and on the posterior side of the facade an additional vajana like projection is shown.14 Water chute is cut on the northern side along the western and northern lateral wall to carry the sacred water that flows from the sanctum. The lateral walls of the mandapa are formed as niches housing dvarapalas. The northern niche is 0.32mts high from the mandapa ground and the niche is 2.22mts height, 1.30mts width and 0.14mts depth. The southern niche is scooped to a height of 0.32mts from ground level and 2.18mts height, 1.37mts width, 0.27 mts depth. The entrance to the sanctum is cut in the middle on the back wall of the mandapa flanked by brahmakanta split pilasters. The back wall of the mandapa remains plain only with two pilasters in the middle flanking the entrance instead of sectioning it by four pilasters. The pilasters directly raise from the mandapa ground15 and in between the pilasters rock cut door frames are formed with sill, lintel and jambs. The height of the sanctum entrance is 1.92mts and the measure between the jambs is 0.92mts. The sanctum floor is formed 0.05mts above the sill level. Two rock cut steps are cut in the foot of the entrance out of which the lower most is formed as chandrakal with well formed scrolls at the ends. The western wall of the mandapa is fully occupied with inscriptions. 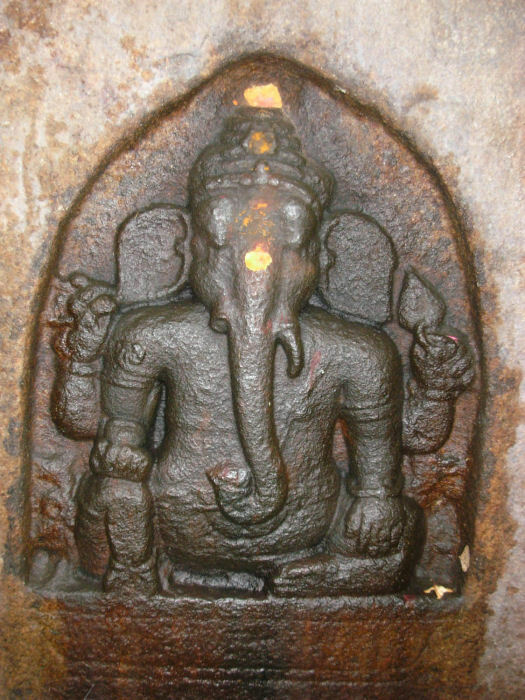 On its southern side a bas-relief Ganesa is carved inside an arched niche which is formed to a height of 0.31mts from mandapa floor level.16 The niche is 0.64mts height, 0.54mts width and 0.05mts depth. The deity is seated in maharajalilasana with front right hand resting on the right knee and holding a motaka, front left hand placed on the left thigh, the back right hand is holding a tusk and back left hand is holding a bud. The trunk of the deity is right turned. His locks are arranged as karandamakuta besides bangles, armlets, udarabandha are the ornaments worn by the deity. The attire is draping upto the knee fastened by hip belt and the knots are seen on both the sides. Yajnopavita is worn in upavita fashion. 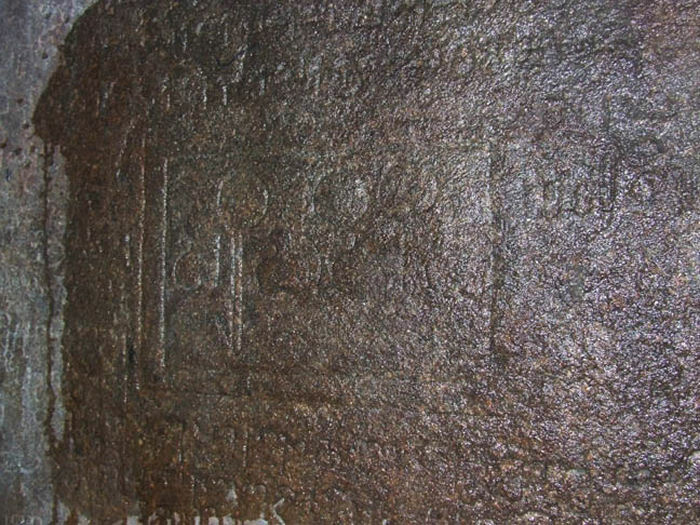 Inscriptions of Early Chola period are seen around the deity. The famous grantha inscription Parivadini is seen above the Ganesa on the west wall of the mandapa. 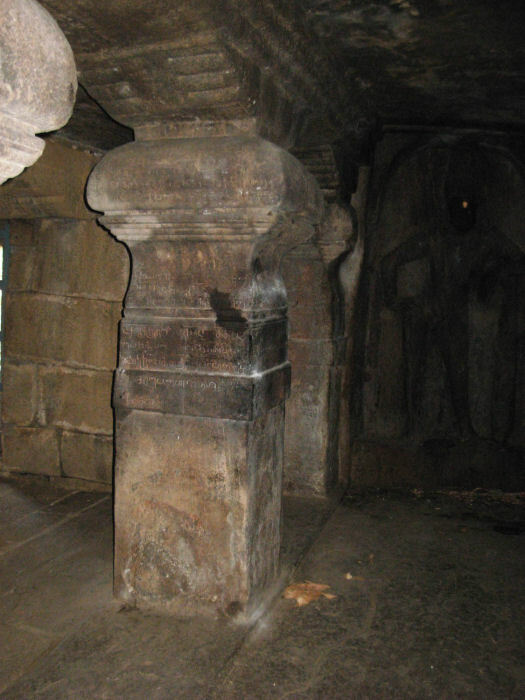 One of the remarkable feature of the rock cut cave is the entrance to the sanctum with bhuta thoranas. Ganas are shown bearing the uttira and vajana above the entrance. Above the pilasters the single limbed angular potikas are shown to hold the uttira. The potikas are also seen inside the sanctum.17 On outer side on its faces are shown the ganas. Each pilaster possesses two ganas facing opposite each other. They are in flying posture holding the uttira and the vajana in their hands and head. The ganas on the outer side are holding the uttira on their head and their inner hand where as their outer hand is rested on their thigh. Their inner leg is raised upward behind in order to hold the uttira. The inner two ganas flanking the entrance are holding the vajana on their head and outer hands, whereas their inner hand is bearing the uttira. Their inner leg is folded straight and their outer legs are raised behind to hold the uttira. Their ornaments and attire are much worn-out. Above the Ganesa the grantha inscription ‘Parivadini-da’ is seen. The inscription is inscribed inside a square frame as seen at other places in the same district viz., Malaiyakkoil, Thirumeyyam. But the Kudumiyanmalai grantha term is inside double frame whereas at other places it is only inside single frame. The sanctum is a cubical cell with 3.75mts in east-west and 4.07mts in north-south directions. The height of the sanctum is 2.49mts. 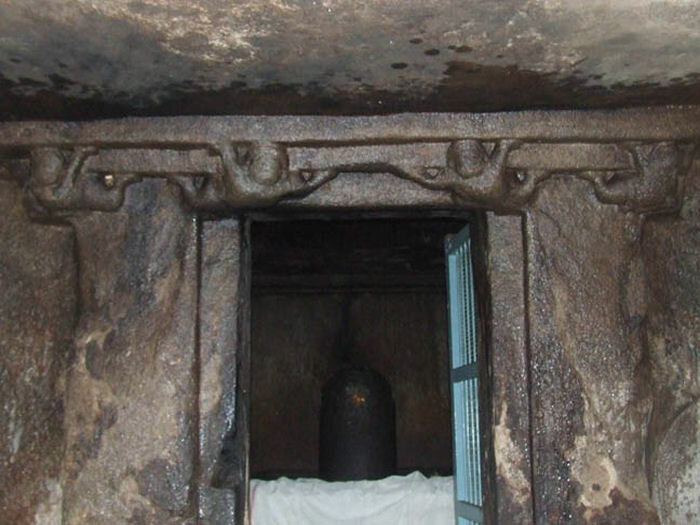 The sanctum houses Lord Siva in the form of rock cut linga.18 The avudaiyar is exact square with 1.55mts in length and breadth and to a height of 0.79mts. It is formed as a padabandha adhishthana with the features of jagati, rudra kumuda, kantha with pada and flanked by kampa, pattika and upari kampa. The rock cut rudra bana is 0.75mts height. The gomukha is seen on the northern side of the avudaiyar to the extension of 0.30mts with a spout like formation under it starting from the jagati component extending upto the mouth of the gomukha. The water pit is 0.18 x 0.33mts under the gomukha is closed and the water outlet is shown running along the northern wall of the sanctum, but at present it is closed by a piece of stone slab. On the southern side of the avudaiyar a small rock cut pita up to the height of kampa is shown. 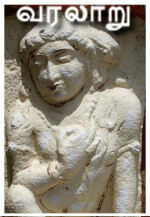 Among the prastara components uttira is absent instead double vajana as seen in the mandapa is also seen in the sanctum. 11. Soundar Rajan K.V., Rock cut Temple styles Early Pandya and The Ellora Shrines, Soumya Publications, Mumbai, New Delhi, 1998, P:83. The author mentions it as malasthana. ஜெ.ராஜா முகமது, ஆவணம் 19, 'புதுக்கோட்டை மாவட்டக் குடைவரைகள். 'இவை கலசம், கம்பம் ஆகிய அங்கங்களைக் கொண்டு விளங்குகின்றன'.. Kambam mentioned by the author is unknown. 2008. P:176. 12. ibid., சு.இராசவேல், அ.கி.சேஷாத்ரி,'தூண்களின் நடுவில் பட்டையுடன் கூடிய தரங்கப் போதிகைகள் அழகுடன் அமைக்கப்பட்டுள்ளன'.. P:171. The potikas are formed above the pillars. 13. ibid., Soundar Rajan K.V., P:83. The author opined that the spacing difference between pillars and pilasters are of Chalukyan influence. 14. Such feature is also seen at Thirugokarnam, the feature can be taken as valabhi, but usually valabhi is a curvy feature. It is absent in the facade and also in the lateral walls. 15. Such feature is also seen at Thirugokarnam. But the back wall at Thirugokarnam is sectioned by pilasters. 16. ibid., சு.இராசவேல், அ.கி.சேஷாத்ரி,'இவ்விநாயகருக்குச் சற்றுத் தொலைவில் சப்தமாதர்களின் புடைப்புச் சிற்பத் தொகுதி காணப்படுகிறது'. The description of the author is wrong, Saptamathas are found nowhere in the rock cut cave or in the temple complex as relief sculptures. P:171. 17. Such feature is seen nowhere in the district.